Welcome to our home! We love this place and would stay here if we could, but the job is taking us out of state. This home has a lot of character and many new upgrades. Nice flooring throughout the house: tile in both upstairs and downstairs bathrooms and upstairs kitchen, and wood flooring in the upstairs living room and downstairs kitchen. Another attractive feature is that the basement apartment can pay for most of your mortgage payment, so you can buy this house and live in it while your tenants pay your house payment! 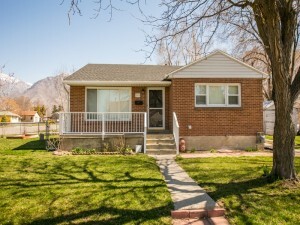 This is a great home to start out in and use as an investment for the future. If you wantthe house to be one unit, the upstairs and downstairs can be turned into a larger 4-bed 2-bath house by simply unlocking the door that separates the two units. Both units have their own separate entrance and there is a separate driveway for each unit that can fit up to three cars on each side. All windows in the house have been upgraded and the roof is new as well. The furnace and hot water heater are newer and very efficient. Throughout the house there are updated lighting fixtures, and in the upstairs kitchen and living room have ceiling flush-mount can lights. Both upstairs and down have two bedrooms and a full bath, separate kitchens, and their own washer and dryer. The back yard is fully-fenced so you can have a dog, and the neighbors have been great. Additionally, Google Fiber will be installed within the next couple of months at this home. From the living room and bedroom windows there is a beautiful view of Mount Timpanogos. The neighborhood is friendly, vibrant and thriving with a great mix of ages and backgrounds. This is a great place to go for a run or a bike ride, and we’re just a couple minutes from the Provo River Trail if you want to explore on that. BYU and UVU are really close and access to i-15 is very quick. It takes less than 10 minutes to get to either campus. Thank you for looking at our home. We really have enjoyed living here and know you will too. This is a great home and a wonderful investment!